The United States Navy Reserve (USNR), known as the United States Naval Reserve from 1915 to 2005, is the Reserve Component (RC) of the United States Navy. Members of the Navy Reserve, called reservists, are enrolled in the Selected Reserve (SELRES), the Individual Ready Reserve (IRR), the Full Time Support (FTS), or the Retired Reserve program. The mission of the Navy Reserve is to provide strategic depth and deliver operational capabilities to the Navy and Marine Corps team, and Joint forces, in the full range of military operations from peace to war. The Reserve consists of 108,718 (64,715 SELRES and 44,003 IRR) officers and enlisted personnel who serve in every state and territory as well as overseas as of September 2012. The largest cohort, the SELRES, have traditionally drilled one weekend a month and two weeks of annual training during the year, receiving base pay and certain special pays (i.e., flight pay, dive pay, etc.) when performing Inactive Duty Training (IDT, aka "drills"), and full pay and allowances while on active duty for Annual Training (AT), Active Duty for Training (ADT), Active Duty for Operational Support (ADOS), Active Duty for Special Work (ADSW), or under Mobilization (MOB) orders or otherwise recalled to full active duty. Every state, as well as Guam and Puerto Rico, has at least one Navy Operational Support Center (NOSC, formerly the Naval Reserve Center), staffed by Full Time Support (FTS) personnel, where the SELRES sailors come to do their weekend drills. The size of these centers varies greatly, depending on the number of assigned reservists. They are intended mostly to handle administrative functions and classroom style training. However, some NOSCs have more extensive training facilities, including damage control trainers and small boat units. Some NOSCs are co-located on existing military facilities, but most are "outside-the-wire", stand alone facilities that are often the only U.S. Navy representation in their communities or even the entire state. Because of this, NOSCs outside the fleet concentration areas are also heavily tasked to provide personnel, both FTS staff and SELRES, for participation in Funeral Honors Details. This service provided to the local community is one of the NOSC's top two priority missions (the other being training and mobilization of SELRES). Those SELRES assigned to front-line operational units, such as Naval Aviators, Naval Flight Officers, Naval Flight Surgeons and enlisted personnel assigned to Navy Reserve or Active-Reserve Integrated (ARI) aviation squadrons and wings, or personnel assigned to major combatant command, Fleet and other major staff positions, are typically funded for far more duty than the weekend per month/two weeks per year construct, often well in excess of 100 man-days per year. SELRES have also performed additional duty in times of war or national crisis, often being recalled to full-time active duty for one, two or three or more years and deploying to overseas locations or aboard warships, as has been recently seen during Operations Enduring Freedom and Iraqi Freedom. FTS, previously known as TAR (Training and Administration of the Reserve), serve in uniform all year round and provide administrative support to SELRES and operational support for the Navy. They are full-time career active duty personnel, but reside in the Reserve Component (RC), and perform a role similar to Active Guard and Reserve (AGR), Air Reserve Technician (ART) and Army Reserve Technician in the Air Force Reserve Command, the Air National Guard, the U.S. Army Reserve, and the Army National Guard. The Individual Ready Reserve (IRR) do not typically drill or train regularly, but can be recalled to service in a full mobilization (requiring a Presidential order). Some IRR personnel who are not currently assigned to SELRES billets, typically senior commissioned officers in the ranks of commander or captain for whom SELRES billets are limited, will serve in Volunteer Training Units (VTU) or will be support assigned to established active duty or reserve commands while in a VTU status. These personnel will drill for points but no pay and are not eligible for Annual Training with pay. However, they remain eligible for other forms of active duty with pay and mobilization. The largest source of IRR Officers in the Navy Reserve are commissioned from the United States Merchant Marine Academy and comprise more than 75% of the Navy's Strategic Sealift Officer Community which is focused on strategic sealift and sea-based logistics. Reservists are called to active duty, or mobilized, as needed and are required to sign paperwork acknowledging this possibility upon enrollment in the reserve program. After the September 11 attacks of 2001, Reservists were mobilized to support combat operations. The War on Terrorism has even seen the activation of a Reserve squadron, the VFA-201 Hunters, flying F/A-18 Hornet aircraft, which deployed on board the USS Theodore Roosevelt (CVN-71). Additionally, more than 52,000 Navy Reservists have been mobilized and deployed to serve in Iraq and Afghanistan, including more than 8,000 who have done a second combat tour. They have served alongside Army, Marine, Air Force, Coast Guard and service personnel from other countries, performing such missions as countering deadly improvised explosive devices, constructing military bases, escorting ground convoys, operating hospitals, performing intelligence analysis, guarding prisoners, and doing customs inspections for units returning from deployments. U.S. Navy reservists from the USS Frederick visiting an Oregon hospital in June 2002. A U.S. Navy Reserve optometrist uses a retina scope and lens rack to check the eyes of 9-year old Honduran boy during the Beyond the Horizon humanitarian assistance exercise in Honduras. 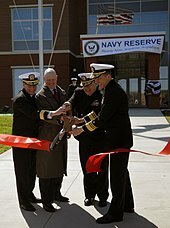 U.S. Navy admirals participate in the ribbon cutting ceremony for the opening of the new Navy Reserve Forces Command Headquarters at Naval Support Activity Norfolk. Reflecting the importance of Reservists in the naval history of the United States, the first citizen sailors put to sea even before the Continental Congress created the Continental Navy, forerunner of today’s U.S. Navy. On 12 June 1775, inspired to act after hearing the news of Minutemen and British regulars battling on the fields of Lexington and Concord, citizens of the seaside town of Machias, Maine, commandeered the schooner Unity and engaged the British warship HMS Margaretta, boarding her and forcing her surrender after bitter close quarters combat. In the ensuing years of the American Revolution, the small size of the Continental Navy necessitated the service of citizen sailors, who put to sea manning privateers, their far-flung raids against the British merchant fleet as important as the sea battles of John Paul Jones in establishing the American naval tradition. Following the American Revolution, the expense of maintaining a standing navy was deemed too great, resulting in the selling of the last Continental Navy ship in 1785. However, attacks by Barbary pirates against American merchant vessels in the Mediterranean Sea prompted a change in course in 1794. A navy that helped give birth to the nation was now deemed essential to preserving its security, which faced its most serious threat during the War of 1812. Not only did reservists raid British commerce on the high seas, but they also outfitted a fleet of barges called the Chesapeake Bay Flotilla in an effort to defend that vital body of water against British invasion. Though overwhelmed by an enemy superior in numbers, these men, most recruited from Baltimore, continued to wage war on land, joining in the defense of Washington, D.C.
Having fought against a foreign power, naval reservists faced a much different struggle with the outbreak of the Civil War, which divided a navy and a nation. Within days of the attack, President Abraham Lincoln authorized an increase in the personnel levels of the Navy, which assumed an important role in the strategy to defeat the Confederacy with a blockade of the South and a campaign to secure control of the Mississippi River. By war's end the Navy had grown from a force numbering 9,942 in 1860 to one manned by 58,296 sailors. A total of 101,207 men from twenty-one states enlisted during the war and volunteers were present during some of the storied naval engagements of the American Civil War, including serving in Monitor during her battle with CSS Virginia and the daring mission to destroy the Confederate ironclad CSS Albermarle. The latter action resulted in the awarding of the Medal of Honor to six reserve enlisted men. With the lack of any major threat to the United States in the post-Civil War years, the U.S. Navy took on the appearance and missions of the force it had in 1860. Then came publication of naval theorist Captain Alfred Thayer Mahan's landmark study The Influence of Sea Power Upon History, which in part prompted a modernization of the U.S. fleet and brought some of the first calls for an organized naval reserve to help man these more advanced ships. In the meantime, state naval militias represented the Navy's manpower reserve, demonstrating their capabilities during the Spanish–American War in which they assisted in coastal defense and served aboard ship. Militiamen from Massachusetts, New York, Michigan, and Maryland manned four auxiliary cruisers—Prairie, Yankee, Yosemite, and Dixie—seeing action off Cuba. All told, some 263 officers and 3,832 enlisted men of various state naval militias answered the call to arms. As successful as the state naval militias were in the Spanish–American War, which made the United States a world power, events unfolding in Europe following the turn of the century demonstrated that a modern war at sea required a federal naval reserve force. The first formally funded naval reserve force was organized around the United States Merchant Marine with the formation of the Merchant Marine Reserve, then called the Naval Auxiliary Reserve, in 1913. With the outbreak of World War I in 1914, the Secretary of the Navy Josephus Daniels and his assistant, a young New Yorker named Franklin D. Roosevelt, launched a campaign in Congress to appropriate funding for such a force. Their efforts brought passage of legislation on 3 March 1915, creating the Naval Reserve Force, whose members served in the cockpits of biplanes and hunted enemy U-boats during the Great War. Though the financial difficulties of the Great Depression and interwar isolationism translated into difficult times for the Naval Reserve, the organizational structure persevered and expanded with the creation of Naval Aviation Cadet program and the Naval Reserve Officer Training Corps. When World War II erupted on 1 September 1939, the Naval Reserve was ready. By the summer of 1941, virtually all of its members were serving on active duty, their numbers destined to swell when Japanese planes roared out of a clear blue sky over Pearl Harbor on 7 December 1941. Navy reserve sailors from Minnesota aboard the USS Ward fired the first U.S. shots of World War II by sinking a Japanese mini-submarine outside the entrance to Pearl Harbor. Over the course of the ensuing four years, the Navy would grow from a force of 383,150 to one that at its peak numbered 3,405,525, the vast majority of them reservists, including five future U.S. presidents. The end of World War II brought a different struggle in the form of the Cold War, which over the course of nearly five decades was waged with the haunting specter of nuclear war. Cold War battlegrounds took naval reservists to Korea, where a massive mobilization of "Weekend Warriors" filled out the complements of ships pulled from mothballs and in some cases sent carriers to sea with almost their entire embarked air groups consisting of Reserve squadrons. Other calls came during the Berlin Crisis and Vietnam, and with the defense build-up of the 1980s, presided over by Secretary of the Navy John Lehman, a naval reservist, the Naval Reserve not only expanded, but also took steps towards greater interoperability with the active component with respect to equipment. Yet, the divisions between the active and reserve cultures remained distinct. This began to change in the 1990s as over 21,000 Naval Reservists supported Operations Desert Shield and Desert Storm, which coincided with the collapse of the Soviet Union. Since that time, whether responding to the ethnic cleansing in the former Yugoslavia or the threat of world terrorism, the latter coming to the forefront in the attacks against the World Trade Center and the Pentagon on 11 September 2001, the recently renamed Navy Reserve has transformed from a force in waiting for massive mobilization to an integral component in carrying out the mission of the U.S. Navy. As Admiral William J. Fallon stated, "We must remember that the Reserves, which represent twenty percent of our warfighting force, are absolutely vital to our Navy's ability to fight and win wars now and in the future." Office of the Chief of Naval Reserve was established as Director of Naval Reserve, with the consolidation of the Navy Air and Surface Reserve headquarters organizations at the Naval Support Activity, NAS New Orleans, Louisiana in April 1973. Aug 1974 Sep 1978 VADM Pierre N. Charbonnet, Jr.
Navy Reserve Navy Diver Seaman Jesse Kole, assigned to Naval Experimental Diving Unit, does an inspection dive of the interior of the wreck of the former Russian submarine Juliett 484. Persons who enlist in the Active duty program first sign a contract to enter the Ready Reserve for a period of time that coincides with time served as Active Duty. Upon separation from Active Duty, members may still be obligated by their reserve contract if it has not expired. The remainder of the contract may be served as a member of the Selected Reserve or the Individual Ready Reserve. Prior service enlistees may be able to affiliate with the Navy Reserve in their active duty rating (job specialty) and paygrade. Non-prior service enlistees are sent to Initial Active Duty Training (IADT), also called boot camp, located at Naval Station Great Lakes in Illinois (same location as Active Duty training) and qualify for a specific billet (job) in order to make their rate permanent. Very few ratings are available to non-prior service personnel. Based upon their skill sets, members will enter into service at paygrades E-1 through E-3. Although non-prior service recruits are paid from their first day at the advanced pay grade, they are not entitled to wear the insignia signifying their rank until they successfully complete boot camp. After graduating from boot camp, the reservist usually trains at a Navy Operational Support Center (NOSC) again to complete the final "Phase IV" requirements. After that, he or she is sent to a reserve unit. Typically, the Reservist is required to drill one weekend every month and spend a consecutive two-week period every year at a regular Navy base or on board a ship. While training either for just a weekend or during the two weeks, the Reservist is on active duty and the full spectrum of rules and regulations, including the Uniform Code of Military Justice, apply. United States Navy reservists are allowed to serve simultaneously in the United States Navy Reserve and in the naval militia of their state of residence; however, when called into federal service, reservists are relieved from service and duty in the naval militia until released from active duty. Under the new system, drilling reservists will pay $47.90 a month for self-only coverage, or $210.83 a month for self and family coverage. This replaces the complex qualification rules previously in place for Reservists receiving Tricare coverage. With the new rule, the only requirement is being in SelRes, meaning the sailor drills one weekend each month. Navy Reservists qualify for the Montgomery G.I. Bill, which covers graduate and undergraduate degrees, vocational and technical school training offered by an institute for higher learning that has been approved for G.I. Bill benefits, tuition assistance, and licensing and certification testing reimbursement. On-the-job training, apprenticeship, correspondence, flight, and preparatory courses might also be covered. With more than 90 days of qualifying accumulated active duty service, Navy Reservists can qualify for benefits under the Post-9/11 GI Bill. Family Servicemembers' Group Life Insurance (FSGLI) is a program extended to the spouses and dependent children of members insured under the SGLI program. FSGLI provides up to a maximum of $100,000 of insurance coverage for spouses, not to exceed the amount of SGLI the insured member has in force, and $10,000 for dependent children. Spousal coverage is issued in increments of $10,000. Reservists and immediate family members with dependent ID cards are allowed to shop at all U.S. military base commissaries (super markets) and base/post exchanges. The Heroes Earning Assistance and Relief Tax Act of 2008 (HEART) makes permanent two important tax code provisions contained in the Pension Protection Act of 2006. The first provision created an exception for mobilized Reservists to make early withdrawals from retirement plans without triggering an early withdrawal tax. The second provision allows a Reservist who received a qualified distribution to contribute the funds to an Individual Retirement Account (IRA), during the two-year period beginning after the end of his or her active duty period. The IRA dollar limitations will not apply to any contribution made following this special repayment rule. The Uniformed Services Employment and Reemployment Rights Act of 1994 (USERRA) is a federal law intended to ensure that persons who serve or have served in the Armed Forces, Reserves, National Guard or other "uniformed services" are not disadvantaged in their civilian careers because of their service; are promptly reemployed in their civilian jobs upon their return from duty; and are not discriminated against in employment based on past, present, or future military service. The federal government is to be a "model employer" under USERRA. Reservists receive the same promotion opportunities as active duty sailors except they compete against other Reservists. Reservists holding their military ID cards are also entitled to receive military discounts at airlines, restaurants, home improvement stores, etc. like their active duty counterparts. Retired Navy Reservists qualify for Veterans Preference if mobilized under US Code, Title 10 or if they have completed more than 180 days of continuous active duty. At least three characters in popular TV shows were officers in the Naval Reserve. These were Commander Steve McGarrett of Hawaii Five-O, Captain R. Quincy of Quincy, M.E., and Commander Thomas Magnum of Magnum PI. They were veterans of World War II, the Korean War, and Vietnam, respectively. ^ "Memorandum for the Secretary of Defense". georgewbush.whitehouse.archives.gov. 29 April 2005. Retrieved 3 May 2011. ^ "NRH - NOSC Locator Map". www.public.navy.mil. ^ "The Navy Reserve Almanac 2011" (PDF). navyreserve.navy.mil. January 2011. Retrieved 3 May 2011. ^ "Deployment of Members of the National Guard and Reserve in the Global War on Terrorism" (PDF). Office of the Under Secretary of Defense For Acquisition, Technology, and Logistics. ^ a b c "History". NavyReserve.com. Retrieved 3 May 2011. ^ "Commanders". US Navy. 3 August 2010. Retrieved 26 July 2011. ^ "How to Join the US Navy with Prior Military Service : Navy.com". ^ "Navy Reserve Recruiting and Training Sites". Navy.com. Retrieved 5 February 2015. ^ "10 U.S. Code § 7853 - Release from Militia duty upon order to active duty in reserve components". www4.law.cornell.edu. Retrieved 17 July 2015. ^ "Who's Eligible". Tricare.mil. 30 November 2010. Retrieved 3 May 2011. ^ "38 USC 4303 Discrimination against persons who serve in the uniformed services and acts of reprisal prohibited". Department of Labor. 13 October 1994. Retrieved 3 May 2011. ^ "10 USC Ch 63 Retirement for Age". US House of Representatives. 1 February 2010. Archived from the original on 3 February 2011. Retrieved 3 May 2011. Winkler, David (2014). Ready Then, Ready Now, Ready Always: More than a Century of Service by Citizen-Sailors. Washington, D.C.: Navy Reserve Centennial Book Committee. ISBN 9780692327654. Wikimedia Commons has media related to United States Navy Reserve.